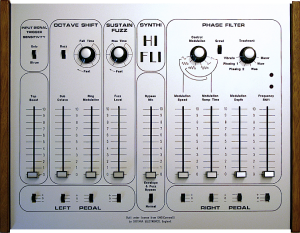 We are pleased to announce a re-release of the classic EMS Synthi Hi-FLi guitar effects unit, built under license from EMS (Cornwall). As these are extremely labour intensive to build, the number of units we will make each year is very limited. A waiting list does exist, but at current production levels it will take at least four to five years to get through these orders! Please contact us for more info. Special thanks goes to Vincent Gallo, whose suggestions and interest in reproducing the Hi-FLi were instrumental to the re-release project. Designed by legendary EMS electronics genius David Cockerell (of Synthi AKS/VCS3/Synthi100 fame) in 1972/3, probably primarily as a guitar effects unit (though it certainly has uses as an analogue effects for synth sounds) and used by the likes of David Gilmour (Pink Floyd), Steve Hackett (ex Genesis) and others. I was intrigued by the air of mystique surrounding this unit. It seems to be regarded by many guitar players out there as the ‘Holy Grail’ of vintage analogue guitar effects. Whether this is because it’s also one of the rarest effects in the world, maybe in part explains this. Although guitar playing is not something I am good at, I was also intrigued by its possible uses on synth type sounds. The re-release is an exact duplicate of the circuits of the original Mk2 Hi-FLi… down to using the same obsolete transistors and the same opamps. The only 'electronics' difference is my use of a very stable toroidal transformer based internal power supply. The case design is of course different. The original was in a wonderful white fibreglass (very 1970s style!) console… something that is beyond my skills to easily reproduce. Therefore I opted for a powder coated black steel chassis with Iroko end-cheeks with a CNC engraved and machined top panel (I made this myself with my CNC engraver/router) in satin anodized silver aluminium. Part of the project was also to clone the original pedal unit… this being a crucial part of the Hi-FLi in my opinion. The audio input (e.g guitar or synth) is via a jack plug built into the side of the left pedal. Control voltages and amplified audio go to the main unit via an 8-way umbilical cable with a Jones plug on the end (just like the original). The right hand pedal has a convenient pot to control the amount of preamp gain. This scaling pot was part of the original Moog pedal so I made good use of it! The Hi-FLI consist of several sections. Those on the left half are Top Boost, Octave Shift (containing Sub-Octave and Ring Modulation features) and Sustain Fuzz. Then a Bypass Mixer (mixing wet/dry signals) divides the left and right parts, the right half consists of probably the most important part as regards sound shaping, a wonderful multi-feature Phase Filter. I also added two features that appeared on the original Hi-FLi Mk2 units: a bypass front panel slide switch to bypass the left hand side effects completely and send the audio signal directly into the Phase Filter (very useful!) and an additional ‘Growl’ switch that drops down the fundamental note extracted from the audio in by two and three octaves (The Sub-Octave drops it by one octave). These sub-harmonics are not just combined with the original sound but used to modulate the phase filter thus allowing very strange/bizarre new sounds to be created. The pedal unit is a fantastic idea. All the front panels sliders simply provide a control voltage to operate each effect… yes all the effects are voltage controlled! On the bottom of each slider is a 3-way slide switch marked '+','0' and '-'. In the '0' position the pedal has no affect on the effect as you operate it and the slider acts as the effect control. In the and or - position operating the left or right pedal sends a control voltage that swings from and 12V to -12V or -12V to and 12V as you move the pedal up/down. The left/right pedals control the left/right hand effects when viewing the top panel. Since there is an independent pedal slide switch on every effect you can imagine the creative possibilities here! There are many many different sounds you can create simply by altering the state of each pedal voltage slider switch. This is a really great idea and is why I said earlier that the pedal unit, in my opinion, is crucial to getting the most out of the Hi-FLi. Before we get on to the effects, an important function of the Hi-FLi is to detect an attack/decay time from the input audio. So for a plucked guitar string the initial attack and the point at which the amplitude drops below a certain level is detected. The attack detection is used to trigger other effects which I’ll discuss later. An exponentially decaying envelope is also generated from this attack/decay section. The attack/decay extraction is rather sensitive and its ‘correct function’ (i.e. single rather than multiple triggers as each string is plucked) depends on how you play (solo/strum) and the input level of the audio from the preamp. Thus there is a panel slide switch for flipping between sensitivities... one for ‘solo’ and the other for ‘strum’ guitar playing. In practice I found you can play as you wish in each mode and get different responses/sounds! Audio in from the preamp in the pedal unit is fed to the Top Boost that is basically a treble boost. It makes quite a big change to the sound when you push the slider up... particularly on fuzz sustain. This section involves a sub-octave generator that extracts a fundamental note form the audio in and drops it by one octave. Rather than simply mix this sub-octave with the original signal something more sophisticated is done. A ‘pseudo’ ring modulation effect occurs where instead of multiplying two waveforms, the RingMod just adds a half wave rectified version of the fundamental to the output of the Top Boost and thus can produce a fundamental that is double in frequency... so a bit like what happens with a standard RingMod where the frequency of a sine wave sent in is doubled though waveform multiplication. But in the Hi-FLi RingMod version one doesn't hear the typical metallic/bell like sounds. Rather this pseudo RingMod signal is sent to a pair of FETs which act as modulators... modulated by the sub-octave signal. The result is some great deep sub-octaves, the amount of which are controlled by the RingMod and sub-octave levels. A fairly standard but nice sounding fuzz section that can be mixed with the output of the Octave Shift. The fuzz input is the from the Top Boost section. The fuzz attack time is controlled from the attack/decay section and is variable. On fast rise times... the fuzz appear instantly as a string is plucked. Slower rise times allow the fuzz to ‘swell’ in amplitude after the string is plucked. So you get a slewed fuzz effect. Great! Here is where the major soundscaping effects occur. The phase filter is in fact six filters and FET/bipolar transistor switches that alter the signal path through the filters of audio fed from the left hand effects. The six different ‘Treatments’ (selected by front panel rotary switch) are Vibrato, Phasing 1, Phasing 2, Waa, Waw and Meow all of which are are the result of different paths that audio is fed through via filter sections. For any given phase filter configuration above, there is in addition, six different modulations you can apply to vary the frequency of the phase filter. Varying the frequency alters the amount of phase shift that occurs in the audio signal. These modulations take the form of ‘transients’ i.e. waveforms that are produced only between the attack and decay sections of say a plucked guitar string. Outside of this ‘attack/decay’ envelope the modulation waveform goes back to a simple sine wave. The six transients are slow sine, fast sine, increasing amplitude sine, decreasing amplitude sine, ramp up and ramp down. Modulation speed is controlled via slider (or pedals) and modulation amount by another slider. Here is a great feature. The time taken for transients to appear modulating the phase filter is controllable. So there is a slow option controllable via the modulation ramp time slider/pedal. Finally there is a slider/pedal that directly shifts the frequency of the phase filter. This allows you to ‘sweep’ the audible range of the filter if you use pedal control. The ‘Growl’ switch option drops the fundamental by two or three octaves depending on the switch position. As mentioned above, these sub-harmonics are used to modulate the phase filter and are not just simply mixed with the original sound. This gives amazing/bizarre new modulations! The amount of growl is controllable via the depth slider and also if the increasing/decreasing sine modulation is selected, by the decaying envelope extracted from the attack/decay section of the input audio. My impression of the phase filter is that it's the ‘guts’ of the Hi-FLi and produces an astonishing range of phasing effects from subtle vibrato to screeching wah sounds all with transient modulations on top! The Envelope and Fuzz bypass switch allows you to bypass completely the left hand effects section of the Hi-FLi and send audio directly into the Phase Filter. This was something (along with Growl) that EMS seem to have added in the Mk2 version of the Hi-FLi... so you wont see it on earlier Mk1 versions. It's a simple idea but allows for yet more different sounds... ’clean phasing’ if you wish. 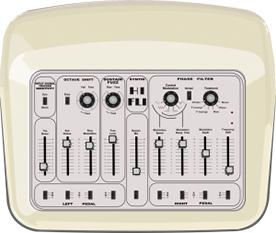 Finally the bypass mix slider is a simple dry/wet mix control of the audio output. I would also suggest checking out the superb original Hi-FLi demos by David Walter Mohr on YouTube. All the effected sounds he makes I can recognise and reproduce on the re-release Hi-FLi. I wish I could play guitar as well as he does.. .thats not something I can so easily reproduce! Here are some direct A/B sound comparisons of the new re-release Hi-FLi compared to a 1972 Mk1 original, kindly loaned by Robin Wood at EMS. Rather than my ropey guitar playing (as you can hear later!) I have used free public domain clean guitar samples to do the test. This is more scientific in that the exact same sample is played through both units. THESE ARE CERTAINLY NOT THE BEST SAMPLES TO DEMO THE INCREDIBLE SOUNDS OF THE Hi-Fli. RATHER THEY ARE SIMPLY BEING USED AS A 'SCIENTIFIC' A/B TEST COMPARING ORIGINAL AND RE-RELEASE Hi-Fli. Note: The original 1970s Mk1 has no growl switch (that came in later versions) and so no A/B comparison was done with the growl switch settings in my test. Also the original unit loaned to me has a non-standard bypass switch (not the same as the one that appeared in later EMS units and which I have implemented in the re-release version ) so again no A/B test was done in bypass mode. The modulation depth of the phase filter in the demos below is quite subtle. The Hi-FLi is easily capable of mad and very deep modulations! It's just I chose these as they seemed appropriate for the demos. Original Your browser does not support the audio element. Re-Release Your browser does not support the audio element. © 2019 Digitana Electronics. All Rights Reserved.